The SYSTEM 8 SmartSwitch is a fully programmable, 2 Channel USB interface designed to operate exclusively with ABI's SYSTEM 8 Ultimate software and test equipment. 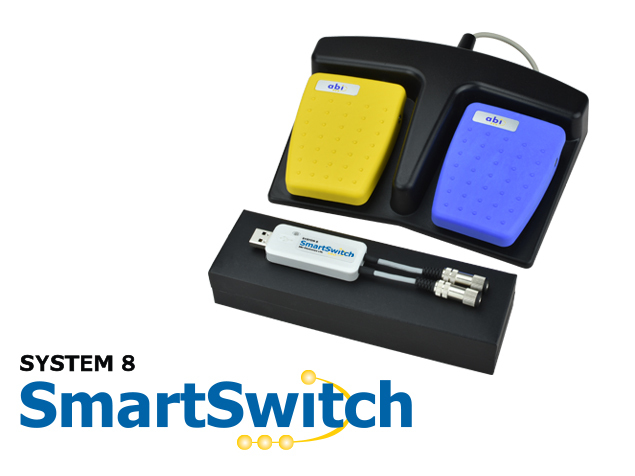 Consisting of a hardware plug & play module that connects to a standard full-size USB port, the SYSTEM 8 SmartSwitch provides 2 channels that can take on up to 4 switch inputs. These inputs can be provided by standard triggering mechanisms such as foot or hand switch, safety buttons, conveyors and compatible sensors. The operator can configure how each input should be interpreted by ABI's software through a built-in, user-friendly Control Panel available in SYSTEM 8 Ultimate. Setting up the SmartSwitch is simple. A list of possible actions and commands associated to ABI’s test instruments, applications and the TestFlow Manager is embedded in the SmartSwitch Control Panel. When used within a TestFlow, the SmartSwitch setup will be recorded and recalled automatically the next time the user runs the same TestFlow file. Watch the videos to find out more details.